lf you’ve got to do is watch and listen to learn how to play 16 of the Fab Four’s most sought after compositions on guitar! Not only does video host Rob Taylor capture impeccably accurate guitar-only renditions of each song, but also ensures that every element of each song is included. This enables the viewer to learn all songs in their entirety! This DVD also exclusively features a spectacular and innovative form of presentation that you just simply won’t find anywhere else! A split-screen effect that shows up to 3 guitar parts being played simultaneously! This invites the viewer to learn all guitar parts that were used in each song.This 55 minute DVD undisputedly offers a far more valuable lesson in Beatles guitarmanship than any other competitive source. You won’t find guitar renditions of Penny Lane, Let it be, Strawberry Fields forever, or any other non-guitar song in this DVD. You’ll only find guitar-oriented songs shown the way the Beatles played them! Rob Taylor has spent over 20 years analyzing guitar parts in Beatles music. This has earned him the ability to play a litany of Beatles songs on cue with amazing accuracy! Rob Taylor goes on to say “One of the finest ways to appreciate Beatles music is to play it yourself, whether amongst a small circle of friends, a public performance, or just by yourself. The love of Beatles music is a fun-spirited, unifying experience that will last for generations to come. ‘Learn to play the Beatles to a Tee!’ exemplifies this tradition with faithful lessons of the Beatles most profound works. “When one browses the selection of songs chosen for this DVD, one might ask “Why these songs in particular?”. Rob answers by saying “Well, partly because these are some of the songs that I had the hardest time learning. Such as McCartney’s finger picking pattern in ‘Blackbird’ and ‘Her Majesty’ as well as Lennon’s finger picking in ‘Julia’ and ‘Dear Prudence’. Both styles are shown up-close and played slowly. We now invite you to go to the DVD clips page to view several short real-time excerpts from the actual video. 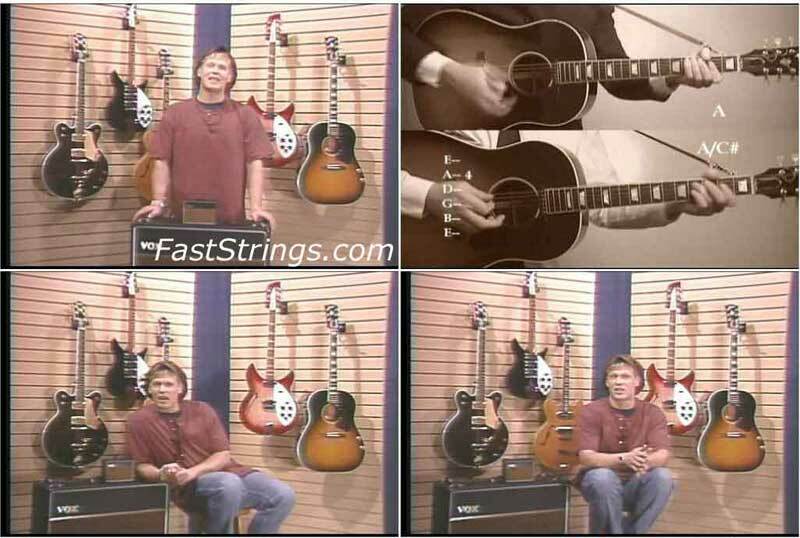 (Slower finger picking patterns, lead segments and various other important tidbits are shown throughout the video, but are not shown here). Hi Steve. Volume 2 is here. There are 4 volumes here. Try to search. Is there going to be any more beatles to a tee volumes. Would love to buy more if there are. very good my friends, very good, a like the beatles is here is all. im a huge beatles fan im 13 and i have played at the cavern 24 time please please let me get the links please!!!!!!!!! Just downloaded this and it seems to be working fine, thanks a lot, been looking for these for a long time.